They say when we deny the story, it defines us; when we own the story, we can write a brave new ending. Cognition and knowledge is not about how many pleasant or unpleasant experiences you've been through; sometimes it is how you can view the same place or thing in different ways and from different perspectives. When I was younger, my understanding of events and people was simple; everything was either black or white. As I grew into a young adult, I came to realize that there were so many shades of gray that I would be forced to discern. I have always seen myself as a relatively cool, calm and collected person; never harbouring resilient doubts of my abilities as an intellectual and as a woman; not realising that my belief about myself would be shaken to the core. At 23 years, I had just graduated from university and was among the top students in my class. Receiving a call on the same day as my graduation, the news that I had been offered a high paying job at a corporate company after three nerve wrecking interviews was like hitting triple jackpot. I am not just speaking from blasé conjecture but from first hand experience. One of the things that came up in my interview was "how I would handle working with the senior males in the department being a younger female". I did not give the question much thought; my perception now is that it was an extremely strong question that the whole selection process was based on the fact that I was a younger female working with older males and who was trying to cross over to a career traditionally assumed to be for males. It is common knowledge that what you allow will continue; If you set the precedent for people to ride roughshod over your rights they will stamp all over you, but what happens if you show up as a confident, mature and rational adult yet you experience abuse and discrimination? Will you remain unchanged? I was the only female in my department among the very few females in the company. Everything was a smooth ride, especially when I wasn't meetings my targets, until I started to generate output and challenged everyone's expectations of me. All of a sudden I became the company's fall man; I would be faulted and blamed for everything that went wrong. But, that was just the beginning of the storm; those were trivial matters that could be swept under the rag. Soon, my ethnicity, age, gender and degree became an issue and were gaining a lot of negative attention from male colleagues even in other branches of the company. I became a target of smear campaigns and I remember I would walk into the glass built office, and the men would ogle at me and scream. I focused on the job, tried to be as calm as possible and prayed that it was just a phase, but it turned out to be wishful thinking on my part. My work was sabotaged, and people would take credit for my efforts such that on the performance measurement report that was forwarded to the main office, I looked like I was doing practically nothing. The work that I did appeared under the name of my male colleagues. They told all the clients that cared to listen that I was just but a secretary! When I complained to the top manager, he assured me that he would look into it but later he passed by my desk with the rest of the male team, read a line of my complaint email, and they burst out laughing. Everything took a nosedive henceforth; my colleagues would send me phonographic videos and videos that suggested I was the problem and that I had no self esteem. My immediate manager told me that they didn't want a woman in their team and that they would frustrate me until I left. The top manager started making passes and ogling at me, claiming that he would "protect" me if I "scratched his back". One female colleague that I confided in, a single mother, was fired on the grounds that she was filling my head with lies about the company. Soon my salary and commission started to be deducted, yet the males were never affected. My subordinates were told not to assist me in any way, and I remember one time one started pointing at me, shouting to everyone that I was just a woman and my place was at home raising a family. In short, I was the "problem" and all the men were the victims. I was eventually told that I wouldn't be confirmed lest I removed my "knickers". I dreaded going to the office; every morning I felt like I was walking into a battlefield, constantly walking on pins and needles, my body always on "fight or flight" mode. One doesn't know the weight of the load she's carrying until she feels it's release; when I received the "Scarlet letter", which I was expecting, I was too exhausted to mourn my loss. Daring not to create a legal haze surrounding my departure, management told everyone that I had resigned. After the Iong 11 month probation, I lost most of my money and I went from executive to beggar; I couldn't pay my student loan so my name was forwarded to the CRB. I had nothing to show at the end of all the hard work and dedication; I felt completely humiliated. It was the classic cat and mouse game; the more I fought for my dignity, my respect and sanity, the worse it got. And for anyone going through what I went through, I know this sounds counterintuitive, but never show strong emotion at the workplace, no matter how badly you feel you have been wronged. That would only be used as ammunition by your "enemies"? By reacting, I was only feeding them, exciting them because now they had my attention, and I looked like the unstable one. Apparently my actions were seen as an attempt to upset the status quo; the misguided notion that women had to assume a submissive subordinate role at the workplace. My plight was seemingly couched in the systems bureaucracy, gender bias and discourse of male dominance. Women are oftentimes only appointed for "window dressing" and their roles , are made ineffective by lack of senior management support. Bottomline: Do not let your own fears of societal rejection dictate who you need to be and allow it to result in surface compliance. "Do not Conform", let that be your guiding mantra. Stand up for yourself, know your truth and speak up, no matter what they say. There are many people who would do anything to break you; who would say you are the problem; who would gaslight you and say you have a skewed perception. People fear what they do not understand and what/who they cannot control. Set and respect your boundaries, never ever apologize for being who you are, never give away your dignity to get or keep a job. The labels they place upon you do not define you, they are just projections of qualities they do not like about themselves. Last but not least, do not supress the pain, embrace then release it; accept that what happened was "FOR YOU," not "TO YOU." Honour your emotions and journey to recovery, forgive those who wronged you and forgive yourself; trust me once you make that shift, you will never be the same person again; you will reach a level of consciousness and realize that those who wronged you need your empathy, not judgement. Their perception has been hazed by old prejudices, distortions and misleading cultural alibis. It's not what happens to us in our lives that makes us into writers; it's what we make out of what happens to us. It's our distinctive point of view. I fully recovered, after a case of agoraphobia and PTSD. That is what inspired me to start writing about the challenges that women and children, especially in Africa have to face, daring to inspire the redefinition of male and female roles until societal consensus is reached. When we dare to walk this world unapologetically, it's how we put our pictures up and validate ourselves; I was punished and vilified for having the nerve, and unmitigated gall to love and reaffirm myself as a woman, a young woman. 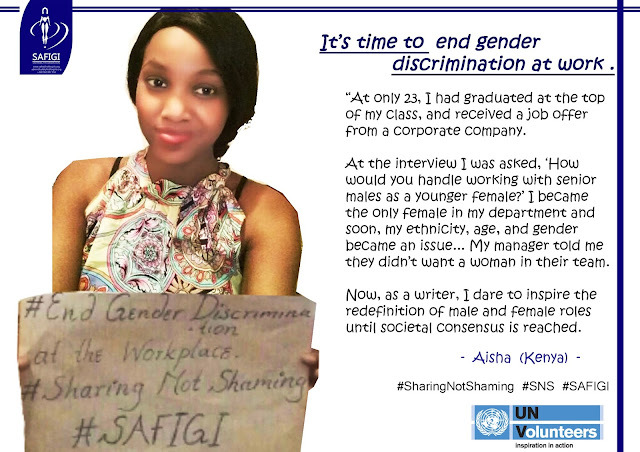 #End Gender Discrimination at the Workplace.